I recently put together a shower gift for a friend of mine. She is such a sweet friend – she is WAY younger than me – she probably thinks of me as ancient!! I helped out with a yearbook class she was part of, I made her wedding dress, we attend church together, we like a lot of the same things, and it’s just fun to be friends with her! Can’t wait till her baby girls gets here – I know she can’t either. This is part of her gift. I made the little ruffled leggings and my friend Marcy made the adorable head band. I also gave her a little pair of chocolate brown leather baby shoes but I forgot to get a picture of them. I included this baby book. It’s vintage, I found it at a garage sale. I don’t expect her to actually make this her one and only baby book but it looked like something she would like. She can use the pictures inside to make some cool artwork if she wants! I added a couple little details to it just for fun, the lace, the medallion sticker, and stamp. The wrapped gift looked like this. I made this ‘bow’. I even took pictures of the process so I could show you how I did it. It’s super easy. I used vintage eclair papers – you can find them here if you want to purchase some! Start by folding the long edge in about 1/2 an inch or less. 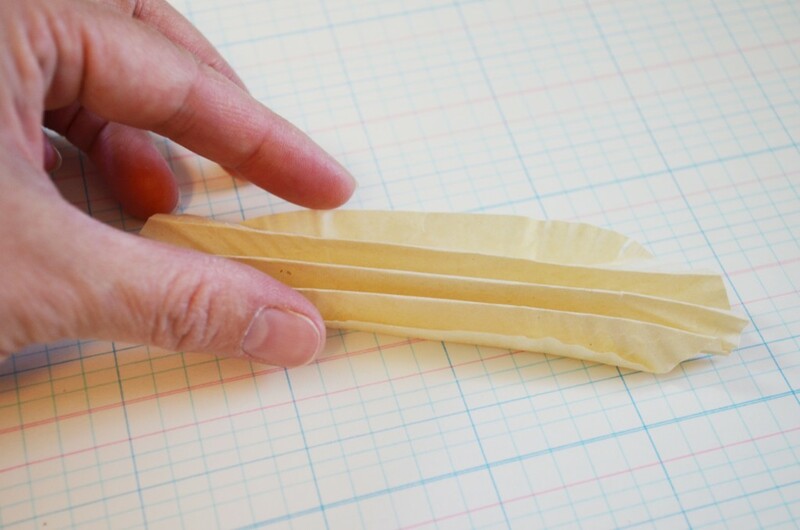 Turn the paper eclair tray over and fold it back on itself the same amount as the first fold. You are basically making accordion folds. Back and forth, back and forth. When you get finished it will look something like this. It works out best if both sides end up folded the same way. Can you see how both sides are folded so the edge is up? The top edge looks more flat in this photo but it folds up, the same way the one at the bottom does. Next Fold the accordioned strip in half. Fasten the inside edges together. I used some double-sided craft adhesive pieces that I’ve had around for years. You can use any kind of adhesive you have on hand or even staple it. I used two adhesive pieces – the blue part peels off so it will stick to the other side when I put it together! This is what your finished piece looks like after fastening it together. I made 3 of these and fastened them all together with the same adhesive that I used to keep the inside edges together. Here it is all finished. I like the finished shape the eclair trays give this. You could do this with any paper – cut out your own, get creative with any paper items you have around. I threaded pink and white bakers twine through a couple of the spaces and tied a simple bow to give it a little finishing touch. Then I stapled it to the ‘BABY’ stamped on pink tickets. I used my stapler from McMaster and Storm to do all my stapling. You can purchase your own here. It is one of my very favorite tools. It’s a beautiful tool and it uses the most adorable, copper colored staples. I would be lost in my craft room without it! So there you have it. An easy DIY bow to dress up any gift. You can detail the center any way you choose. Hot glue a button, tie it with lace, add a fun sticker. You could even put this on a guys gift by detailing the center with something masculine. Like these horse shoes or horse head medallions found here. Have a wonderful weekend – I hope the sun is shining on all of you like it is here on us today! I have a praise in that our home has officially sold. I now have just 32 to days to find a home, pack and move. A little pressure? 🙂 We put a bid on a home yesterday that will give “The Money Pit” a run for it’s money. For whomever you nurture, have a happy and blessed Mother’s Day. Ok, here’s what I want to know. Who looks at eclair liners and decides to make a bow flower out of them? You are so crafty! Love it, I’m sure Lauren was blessed by it – it looks just right like her!